I’ve spoken of neoteny before in regards to domestic dogs- the concept that domestic dogs retain juvenile traits of their ancestral species, the gray wolf, into adulthood. These traits can include folded ears, shorter snouts, barking, more limited social behaviors, and a higher incidence of “puppyish” behaviors. For example, this dog is pestering me for attention right now. 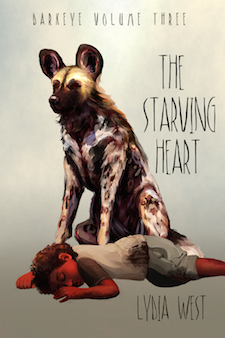 But I think that while this concept isn’t new to those familiar with the evolution of the domestic dog, many people aren’t aware that there is an entire field of study devoted to examining the rates at which animals develop. Heterochrony refers to the timing of developmental events in one species’ lifespan compared to another. 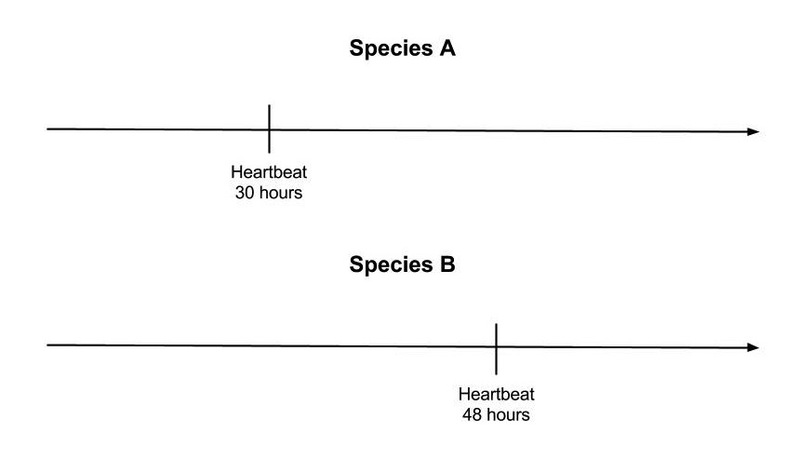 When comparing heart development in species A and species B, we would call the fact that species A develops a heartbeat earlier than species B predisplacement. Likewise, the fact that species B develops the trait later than species A would be termed postdisplacement. Remember, heterochrony only applies when comparing two or more species. If we just looked at one we would have nothing to go on in terms of how early or late development is. The only exception to this is when different heterochronies arise within a single species (more on that later). A large aspect of heterochrony involves looking at organisms that have different juvenile and adult forms. This covers animals that undergo metamorphosis like many amphibian and insect species, but even mammals usually have a juvenile form that looks different than the adult form. And I’m not talking about size- I’m talking about proportions. Consider a human baby. The size of a the head of a human baby and even a human child is much larger in proportion to the body than the head of an adult human. This means that the human head grows at a slower rate than other parts of the body. Conversely, you can see that human legs grow longer at a faster rate. This process is called allometric scaling. The opposite, where body parts grow in proportion to one another, is called isometric scaling. Now, organisms that undergo metamorphasis don’t just grow body parts at different rates- they lose and gain completely different parts between their larval and adult forms, almost as though they are going through a second fetal stage. Interestingly enough, most amphibians and some insects undergo isometric growth after metamorphosis- they get bigger and their proportions don’t change. 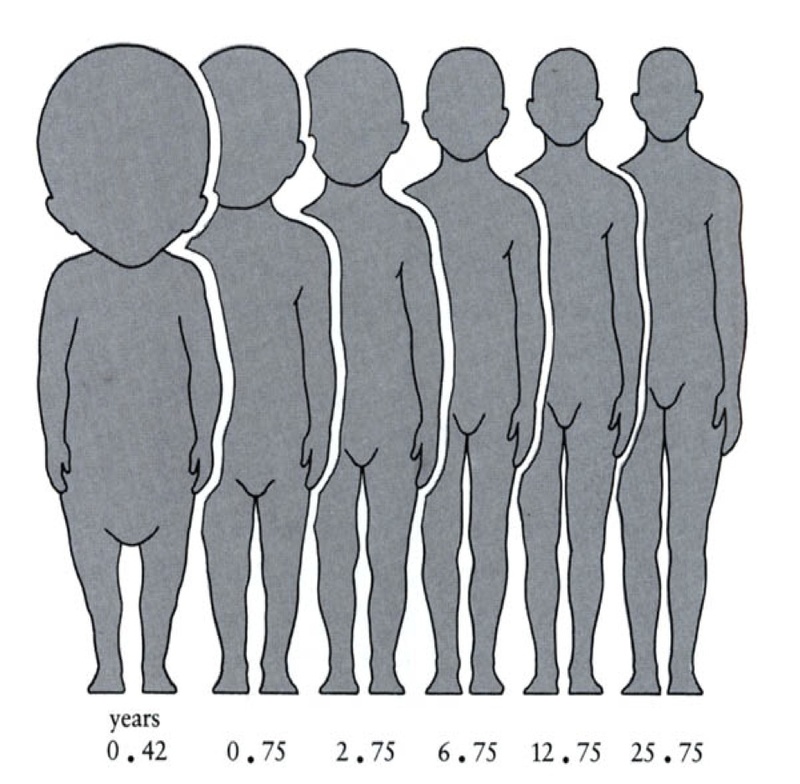 Paedomorphosis occurs when a species resembles the juvenile form of its ancestor, while peramorphosis occurs when the adult form of the ancestor resembles the juvenile form of the descendant. The axolotl and the tiger salamander are two species that we can use to explain this in more detail. They are two very closely related types of mole salamander, and it is believed that one evolved from a very similar ancestral species of the other. Here are pictures of juvenile axolotls and tiger salamanders side by side. The two larvae look very similar, and both are fully aquatic. Note the presence of gills and a large tail fin. Now have a look at the adults of both species. This is where we see a huge difference in looks. The adult tiger salamander is terrestrial, evidenced by its lack of gills and tail fin, strong legs, and eyes that can blink. The adult axolotl simply looks like a larger version of the larva, and it continues to live a fully aquatic life. Depending on which species represents the ancestral state, we could either say the axolotl is paedomorphic compared to the tiger salamander or that the tiger salamander is paramorphic compared to the axolotl. 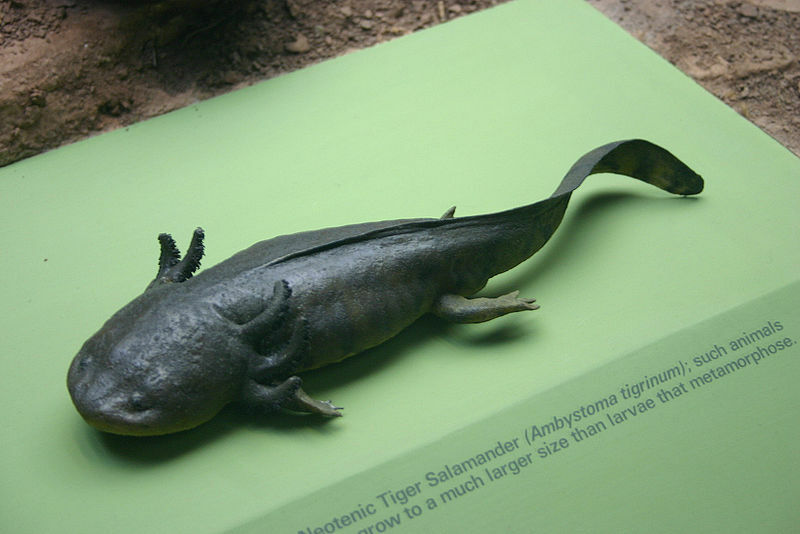 In fact, the tiger salamander is what the axolotl’s ancestral form probably looked like. The tiger salamander actually has a unique trick up its sleeve: when the larvae live in very high-quality aquatic habitats, they may not undergo metamorphosis and become sexually mature adults in their larval form, just like the axolotl. This is a common tactic in many salamander species, and is very useful depending on whether aquatic or terrestrial habitat is available. 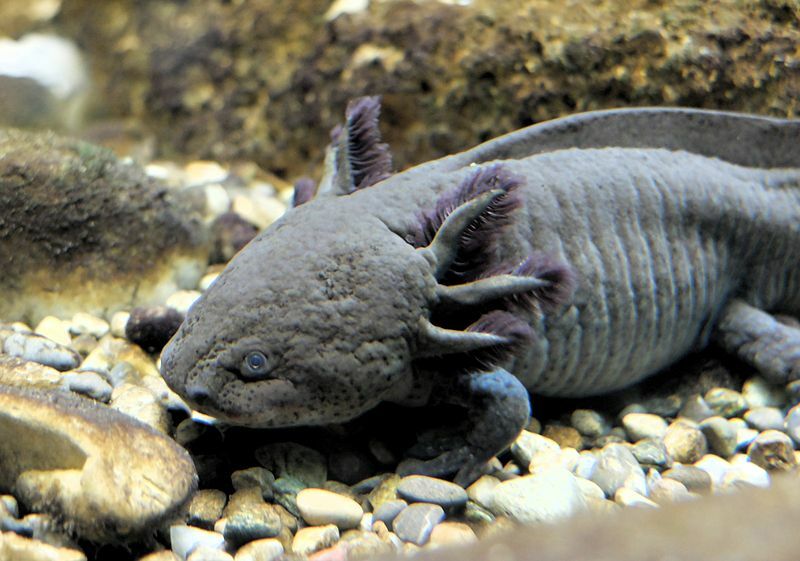 It is believed that the axolotl evolved when a genetic defect developed in a tiger salamander-like ancestor that stopped it from being able to metamorphose at all. Salamanders are not the only types of animals that can have both paramorphic and paedomorphic forms within the same species. 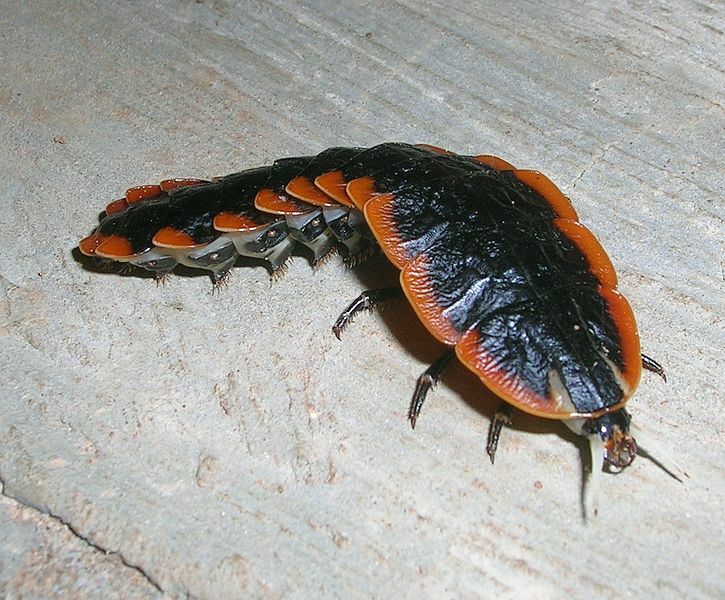 It is commonly seen between male and female insects. 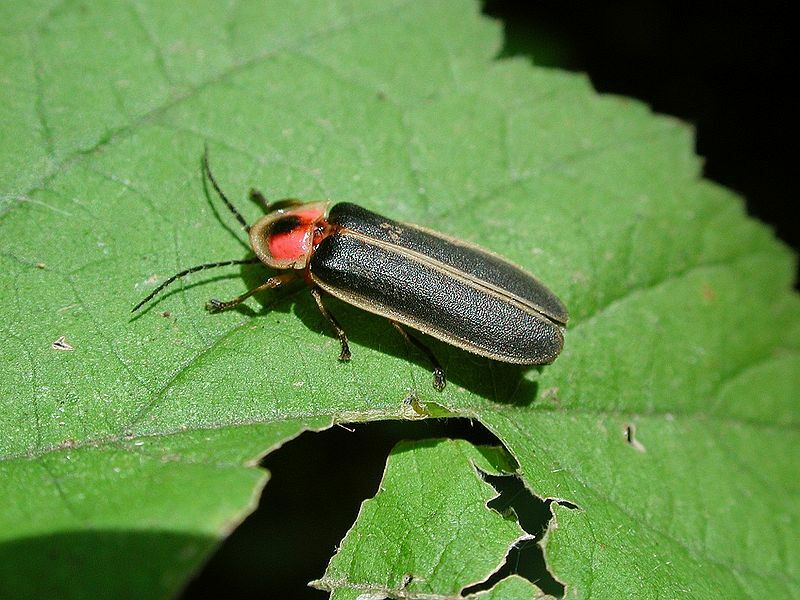 For example, the females of many firefly species are paedomorphic compared to their male counterparts. The females in these species are called “larviform” females because they do not fully develop adult traits (wings, etc.) during pupation. You can see the vestigial wing buds on the female firefly above. The reasons these differences appear between the sexes is likely because they have different goals: the males want to seek out and mate with as many females as possible, hence they need wings; while the female needs only mate once and needs more energy to produce her eggs. Growing wings would be a waste of that. Within paramorphosis and paedomorphosis are more discrete categories. However, here we run into some trouble. The scientific community does not agree on the exact definitions of the terms I am about to describe, to the extent where I have seen two completely different definitions taught in two separate biology courses. It is slightly ridiculous. So I want to clarify that while I am giving the definitions that make the most sense to me and fit best into my understanding, there are other definitions out there that aren’t necessarily wrong. Ok, so if you remember my discussion of neoteny in dogs earlier it should be obvious that neoteny is a form of paedomorphosis- an adult dog often resembles a juvenile or even fetal wolf. But neoteny refers to a specific type of paedomorphosis where the target organism’s germ (reproductive) cell line grows at the same rate as the ancestor’s, while the somatic (rest of the body) cell line is delayed in growth. If that was confusing, let me try to explain it in simpler terms. Let’s refer back to the axolotl and the tiger salamander. 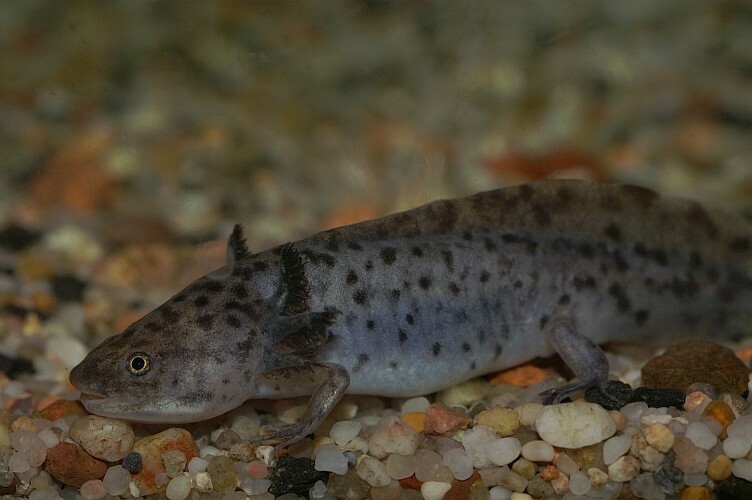 The axolotl is neotenic compared to the tiger salamander because it looks like a larva as an adult- however, the axolotl reaches sexual maturity at the same age that a tiger salamander does. The same goes for our other example neotenic species, the dog. The opposite of neoteny is called acceleration, in which the somatic cell line of one organism advances more than the somatic cell line of the other. The germ cell lines still grow at the same rate, however. You could refer to tiger salamanders as accelerated compared to axolotls. Progenesis is an entirely different form of paedomorphy, though it still results in a juvenile-looking species. In progenesis, the germ cell line grows at an accelerated rate in the target organism while the somatic cell line grows at the same rate. Essentially you end up with a species that can breed earlier at a more juvenile stage of its life. It has been proposed that birds are progenic compared to theropod dinosaurs- they have many paedomorphic features: rounded skulls, reduced digits, small body size, and full plumage, to name just a few. Left: Adult Utahraptor ostrommaysorum. (Art by Emily Willoughby.) Right: Adult red-tailed hawk. (Source.) 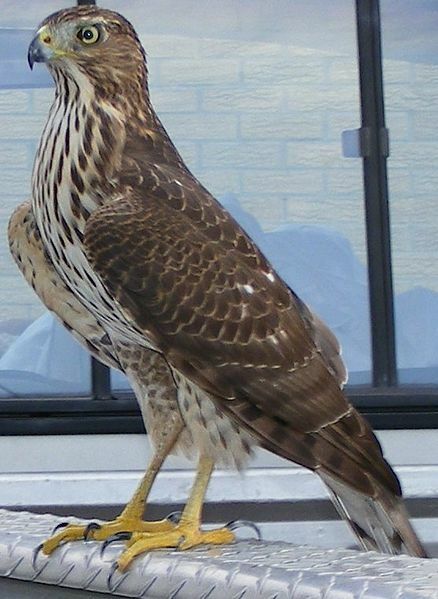 When comparing the two side-by-side, the hawk’s more juvenile proportions become apparent. Being able to breed at a smaller body size may have conferred a large evolutionary advantage to the theropod ancestors of birds- they could hide in more places and survive on smaller prey. Eventually they developed arboreal, gliding, and then flying body forms. The opposite of progenesis is called hypermorphosis. Hypermorphic animals have delayed germ line development so that they breed at a later life stage than their ancestors. In both progenesis and neoteny, growth stops once the animals reach sexual maturity, leading to an adult with a more juvenile form. Heterochrony doesn’t just affect the physical body. The appearance of certain behaviors is also an aspect of developmental timing. For example, let’s go back to comparing dogs and wolves. There is a specific window of time soon after birth in many mammal species called the critical period. The critical period is highly important for the development of certain sensory neurons- for example, kittens kept in the dark during their critical period will nearly go blind. There is a specific critical period called the critical period of socialization, and it’s just as it sounds: social behaviors are developed at this time, including parental attachment. It’s also a period in which young mammals begin boldly exploring their environments. They essentially learn which things are scary and which are friendly while under the protection and care of their parents. After this critical period ends, however, the animals are much less likely to explore and accept new experiences. The sensory critical periods in dog and wolf puppies are essentially the same, but their critical periods of socialization are drastically different. The wolf’s critical period begins at two weeks of age and ends at six weeks of age, while the dog’s critical period begins at four weeks of age and ends at eight weeks of age. 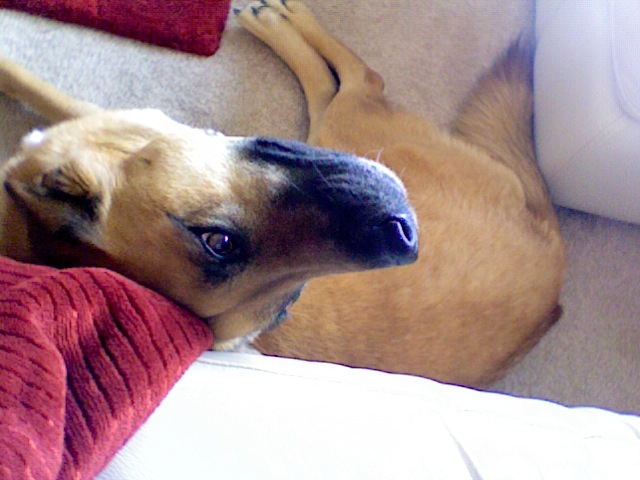 This forward shift is a type of behavioral postdisplacement in the case of the dog. But what’s the significance of delaying the onset of this critical period for just two weeks? Well, as I stated before, the senses of both dog and wolf puppies develop at the same rate. Smell develops within the first few days, hearing after about two and a half weeks, and sight after the first four weeks. If you’ve been following along, you’ll realize that the wolf critical period starts when they are still blind and deaf, while the dog critical period starts when they have all of their senses. The wolf’s critical period of socialization can be described as a series of sensory shocks: as it develops its new senses, new experiences are more frightening because of their unfamiliarity. Conversely, once the dog puppies start exploring, they are already accustomed to all of their senses. It also means that dogs have much more time to get comfortable with objects and environments based on visual and auditory stimuli during their critical period, while wolf puppies more or less lock down just as all their senses fully develop. For a wolf, fear is very important, and it makes sense to be scared of new things: more often than not, a new experience in nature is one that can get you killed. But the survival of a dog actually depends on its ability to get accustomed to new things and new people: a friendly dog is much more likely to find a home than a shy or aggressive one. So that’s a more-or-less brief view of some of the fascinating aspects of heterochrony. Evolution is highly conservative and it has a tendancy to shift, delay, or exaggerate traits rather than create entirely new ones. You’d be surprised at how many of our differences from other animals come from simple changes in developmental timing. Read on: For more wet, wild n’ wacky evolution, head over here to learn about why animals have differently-shaped pupils. For more on the dog family- which has members with both vertical and round pupils!- try the introduction to Canidae. To learn about some rapidly-developing baby birds, try the cowbird’s guide to brood parasitism. For when the development of behavior can go wrong, there’s mental disorders in animals. Brues, C. T. (1941). 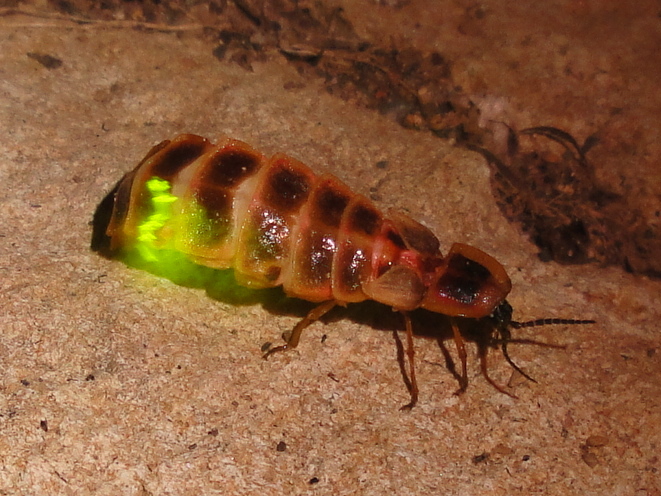 Characteristics of the larviform female of the lampyrid beetle, Lamprophorus. Psyche, 48(1), 41-44. Lord, K. (2013). A comparison of the sensory development of wolves (Canis lupus lupus) and dogs (Canis lupus familiaris). Ethology, 119(2), 110-120. Mower, G. D. (1991). The effect of dark rearing on the time course of the critical period in cat visual cortex. Developmental brain research, 58(2), 151-158. Negreiros-Fransozo, M. L., Colpo, K. D., & Costa, T. M. (2003). Allometric growth in the fiddler crab Uca thayeri (Brachyura, Ocypodidae) from a subtropical mangrove. Journal of Crustacean Biology, 23(2), 273-279. Semlitsch, R. D. (1987). Paedomorphosis in Ambystoma talpoideum: effects of density, food, and pond drying. Ecology, 68(4), 994-1002. Thulborn, R. A. (2006). Theropod dinosaurs, progenesis and birds: homology of digits in the manus. Neues Jahrbuch fuer Geologie und Palaeontologie. Abhandlungen, 242(2/3), 205-241. Trenham, P. C., Bradley Shaffer, H., Koenig, W. D., & Stromberg, M. R. (2000). 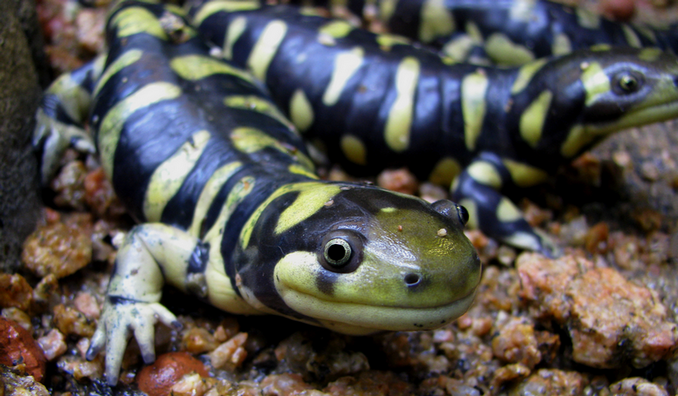 Life history and demographic variation in the California tiger salamander (Ambystoma californiense). Copeia, 2000(2), 365-377. Wake, D. B. (2009). What salamanders have taught us about evolution. Annu. Rev. Ecol. Evol. Syst., 40, 333-352.